The Two Sides of Ana: Episode 42 | TeleNovela Channel - Bringing you closer to lifes drama. 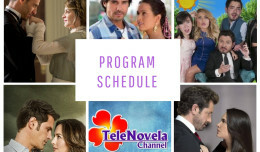 Ana meets Cristobal in Graciela’s house and tells him what happened to Fabian in New York. Meantime, Rafael quits Dionisio’s company as he passed the entrance exam in the university while Ana, Graciela and Katy listen to a taped conversation of Ignacio telling Humberto about the anonymous emails he has been receiving.